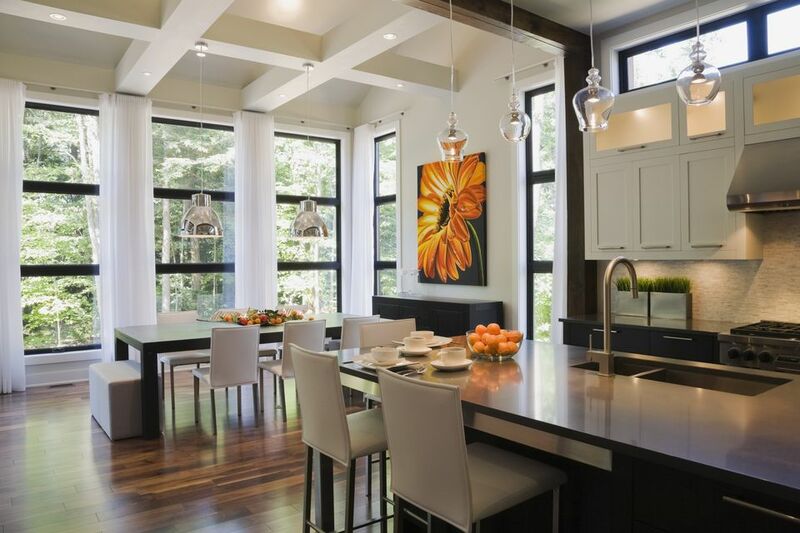 The kitchen is a busy, high impact room that is tough on its surfaces, especially the floors. From spills and splashes to food stains to dropped utensils and dishes, there are a number of different challenges that your floors will have to face. While hardwood is an acceptable material for this space, it does require some regular maintenance and may be susceptible to a few dangers that could ruin the flooring or its finish. Wood flooring can run as little as $3 to $4 per square foot on the lower end and as much as $10 or even $20 for exotic high-end materials. In a kitchen, you want to make sure that you purchase a very dense, durable hardwood, and stay away from softwood floors, which may be more prone to water damage and staining issues. Before you start the installation process, be sure to check whether there is a warranty on the hardwood materials. If there is you should read it carefully to see if anything in the contract mentions that the protection offered will be made null and void if it is installed in a kitchen or any space where water may be a hazard. Hardwood is one of the most difficult and complex flooring materials to install in a kitchen, requiring many cuts and proper layout to make it all look good and integrate well with the cabinetry and other elements. In general, amateurs should be very cautious about undertaking such a project, and unless you know what you are doing, the help of a professional is recommended. All hardwood flooring in a kitchen must be coated with a durable finish to protect the wood from moisture, stains, and wear. While hardwood floors in living areas may be finished with various traditional penetrating oils, kitchen floors typically need a surface finish, such as polyurethane, that completely seals the wood surface to prevent penetration from water and staining agents and creates a highly washable surface. Hardwood flooring can be bought prefinished, or it can be finished on site as part of the installation. Prefinished hardwood flooring is treated at the factory with a very durable UV-cured urethane sealant embedded with aluminum oxide crystals. The protective coating created by this process is much more durable than anything that can be applied on site and can last up to five times longer than traditional site-applied finishes. The drawback to this is that the planks that are prefinished are generally sold with rounded, beveled edges. That means that when they are installed, there are minute gaps that appear in between the various pieces. This can allow water, and other staining agents in a kitchen to slip down between the floorboards, and start causing damage. Wood flooring that is finished on site is first sanded so that all of the planks are perfectly flush with one another. An optional stain may then be applied, followed by three or more coats of polyurethane or a similar clear finish. Initially, the finish is more or less continuous and bridges over the joints between planks. But as the wood planks expand and contract with seasonal humidity changes, the finish will inevitably develop small cracks along the joints of some boards. These can allow moisture to get below the surface, as with prefinished flooring. The most important thing that you can do to maintain your hardwood kitchen floors is to keep constant vigilance over them. If anything spills, wipe it up immediately, and never allow water to stand on the surface for any amount of time. It will also be necessary to sweep or vacuum the floors regularly, in order to keep them free of dirt and grit that can scratch the wood and wear away the finish. As a general rule, it is best to mop wood floors only occasionally and to do so with a slightly dampened mop or towel. Wet-mopping brings too much moisture in contact with the flooring and should be avoided. When a hardwood floor starts to get damaged and worn down, you have the option of refinishing it. This involves sanding the surface down past the finish and any other defects, then re-applying stain (if desired) and a protective finish, as with an initial on-site finishing. Standard 3/4-inch-thick hardwood planks usually be refinished about 10 times over the life of the flooring. If you maintain a floor carefully and do not apply wax or oil that can prevent a bond with new finish, you also have the option of recoating the finish every few years without having to sand off the old finish.